I wasn’t really thinking about much at the time except that I really liked the new design and the fact that they had made it significantly lighter. Having worn it during all-weather and on a 2,000+ kay journey from Queensland to Victoria and for a million short commutes on different bikes I feel like I can finally give you a long-term review, and verdict on the Arai XD4 Helmet . 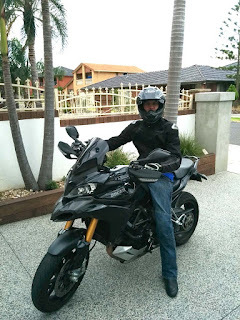 Price is always important when buying a helmet that is going to protect your vital noggin, and this helmet falls into what I would call the mid-range category around the 500-600 AUD range. It might have come down in price now, although it is still a current range of DS helmets in a range of colours and graphics. I don’t think anyone buys a dual sport helmet thinking it’s going to be quiet. I knew it wouldn’t be, but this lid is the antithesis of quiet. I’ve got a cheap MX helmet with full open face that covers my ears better than this lid. Over time it’s gotten louder and floppier and right about now at around the two-year mark I reckon it actually should be retired. That’s not great value out of a lid in my book, while it has done some good kays, it’s not going to make the 5 year mark for recommended replacement, not even close. I still wear it on Dizzy for the commute though. This is one of the reasons I went for the XD 4 in the first place, it does have a good balance point and the beak and peak have been well centralised so that the peak provides good protection in direct sunlight and the beak/snout gives it that balance. Overall I think the balance on the XD 4 is a highlight of the dual sport helmet when compared with the Shoei Hornet DS which is the direct competitor to the Arai in this mid range price bracket. The Shoei’s peak is higher but has better supporting points (3 vs 2 on the Arai) but I think it offers less protection in head on daylight. Murphy has confirmed this having chosen the Shoei and says that the beak is situated too high to offer real protection. Overall vision on the XD is excellent as you would expect from a DS helmet with peripheral vision wider than your eyeballs can take in. The visor is wide and deep and has great unrestricted vision. Removing the visor and peak is super fiddly. It only takes a five cent piece and a twist but the covers, screws, visor and beak all fit together at once and that’s quite some multitasking to do on the fly, especially if you’ve been riding with a tinted visor all day and have some serious fatigue going, you try to fiddle around with itty bitty pieces at high level accuracy to change to a clear visor isn’t easy. I also found the screws and inner thread to be easy to cross thread too. While riding with the peak on you can comfortably adjust your viewing angle with the air flow being really well sent through the peak and out over your head.The best thing about this helmet is by far this peak design. A slight nod of the head provides excellent shade, even the most direct sunlight at sunrise, it’s a freaking god send riding into the blazing glare. This was especially good on the long ride from Queensland to Victoria, but it’s not without it’s downfalls, or compromises depending on how you look at it. The down fall is strangely enough, the wind. If it picks up and in the real world it often does, this beak is a neck breaker. If you tip it up too far and you are in serious trouble with a constant fight to keep it down. In a cross wind it puts pressure on your neck sideways. On the longer rides I’ve worn it on I found this unworkable and had to remove the peak. 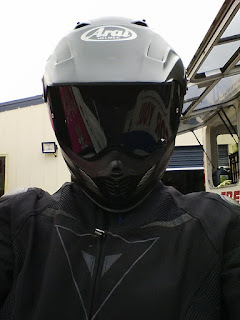 This creates the best visual with a part stig part darth vader kind of look and as a faux full face helmet with its odd shape it actually cuts through the wind and relatively high-speed quite well. This doesn’t make up for any of the roaring wind in your ears but it’s a solution of sorts that kind of makes it two helmets in one with the appropriate level of fiddling. Never fitted one because of the relatively poor fit of the main screen which leaves enough air flow to not worry about fogging, except on the coldest of days. 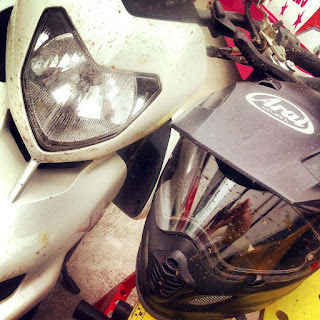 This is a bit of trick Arai employ to eradicate too much fogging and it works to a degree. There are two vents that are easy enough to open with a gloved hand at the top of the visor. Open or closed, pretty straight forward and a good evolution of design in my opinion. Front and rear, left and right, on or off and they offer limited overall airflow when compared with a full face helmet with excellent ventilation like the Shoei GT Air. It’s surprising how you don’t know until you really truly try something else. Direct comparison and personal experience is the only thing that can give you this. I have had both and know the difference now, and these helmet vents aren’t really anything above average. I could never work out whether this was open or closed and to be honest, it never seems to make a massive difference. I’m pretty sure I kept them open all of the time and just left it at that. Why do they always get this so wrong? This strap is too short on the D bracket side and the button clasp is up way to high on the same side. This renders it completely impossible to do up and close with a glove on. Impossilble. On top of that they use the cheap plastic clasps that in my experience, fade over time and end up not working at all. 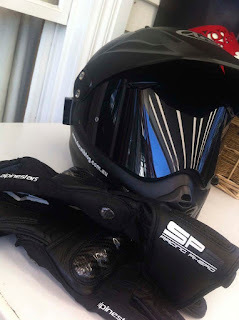 Personally I find the one-handed emergency release clasp type helmets found in racing karts are far easier to use but I’ve never had a single road helmet that uses them. At first I thought this was quite a light lid. After riding two thousand kilometres wearing it I have changed my mind completely. 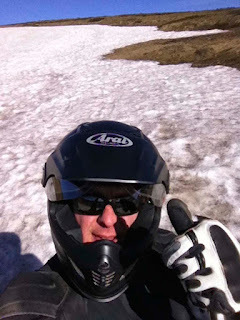 After wearing the Shoei GT Air, although not a fair comparison, I have still changed my mind. This lid is heavy. For anything other than short blasts and maybe the odd 100-200km journey this thing becomes come weighty on your neck add in all the wind blast created by that beak if caught in a cross wind and it’s close to unbearable. Definitely the beak and the overall aesthetic. I still wear this lid quite frequently despite its short comings and on the daily commute it serves me well most of all because of the directions I have to ride. That peak is second to none. You can also easily wear sunglasses with this lid, the arms slide in nicely and cause no fuss because it is quite open. I imagine that a set of MX goggles would replace the visor for enduro riding too. Ok so I’m contradicting myself or creating some sort of inverse double negative here in saying that the peak is also it’s downfall. The wind drag as a long rage touring helmet strikes it off the list. But if you are a 60/40 dual sport enthusiast this might be the go. You can take the visor of and a set of MX goggles take it’s place pretty easy. Then there’s the weight, the chin strap and the noise to content with. It’s not without it’s cons. 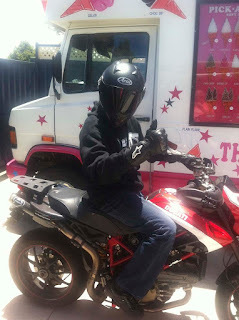 The Arai XD 4 is a good mid range dual sport helmet with a few short comings that if you can look past or put up with, and everyone’s experience is subjective so you need to try them yourself to truly know - something we really battle with in Australia - range and test units. If you want a lid that isn’t in a store then you are money down without even putting one on your head. The problem I currently face in wanting to try the latest Arai CTZ dual sport half-open face helmet. An odd new design that has cheek paddings like a full face but no chin like a full face, but with a full face screen that neatly folds up under it’s peak. Quite an interesting lid I’d like to try but alas, no-one stocks it in Victoria - and I’m not forking out $500 without at least a fitting first. Le sigh. Australia. So bloody far away from everywhere else.